In an inventive tour de force that seldom, if ever, has been equalled for its brilliance and far-reaching consequences, James Watt radically altered the steam engine not only by adding a separate condenser but by creating a whole new family of linkages. His approach was largely empirical, as we use the word today. This study suggests that, despite the glamor of today's sophisticated methods of calculation, a highly developed intuitive sense, reinforced by a knowledge of the past, is still indispensable to the design of successful mechanisms. THE AUTHOR: Eugene S. Ferguson, formerly curator of mechanical and civil engineering in the United States National Museum, Smithsonian Institution, is now professor of mechanical engineering at Iowa State University of Science and Technology. In engineering schools today, a student is introduced to the kinematics of mechanisms by means of a course of kinematic analysis, which is concerned with principles underlying the motions occurring in mechanisms. These principles are demonstrated by a study of mechanisms already in existence, such as the linkage of a retractable landing gear, computing mechanisms, mechanisms used in an automobile, and the like. A systematic, if not rigorous, approach to the design of gears and cams also is usually presented in such a course. Until recently, however, no serious attempt was made to apply the principles developed in kinematic analysis to the more complex problem of kinematic synthesis of linkages. By kinematic synthesis is meant the designing of a linkage to produce a given series of motions for a particular purpose. 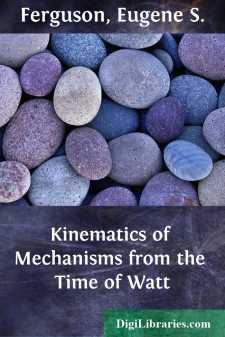 That a rational—numerical or geometrical—approach to kinematic synthesis is possible is a relatively recent idea, not yet fully accepted; but it is this idea that is responsible for the intense scholarly interest in the kinematics of mechanisms that has occurred in this country within the last 10 years. This scholarly activity has resulted in the rediscovery of many earlier works on the subject, and nearly all the scholars now working in this field have acknowledged in one way or another their debt to those who arrived on the scene at an earlier time than they. There have been occasional reviews of the sequence and nature of developments, but the emphasis naturally has been upon the recent past. It seems to me that there is something to be gained in looking beyond our own generation, or even beyond the time of Franz Reuleaux (1829-1905), who is generally credited with originating many of our modern concepts of mechanism analysis and design, and to inquire into the ideas that made possible Reuleaux's contributions. Take to Kinematics. It will repay you. It is more fecund than geometry; it adds a fourth dimension to space.